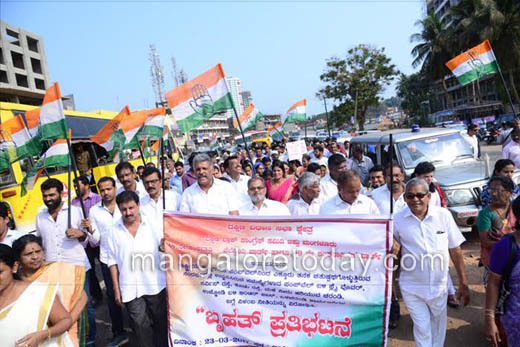 Mangaluru, Mar 23, 2017: Mangaluru South Block Congress Committe today March 23, Thursday held a protest rally against the delay in the construction of flyover at Pumpwell and poor condition of roads in the city. They demanded to speed up construction work of flyovers and take immediate steps to repair broken roads in the different areas of the city. Nothing has been done to clean drains which cause waterlogging during rainy days. The slow construction work at the flyover results in traffic jam. The four way Vajpayee plane had begun in 2009 but it is till not complete. The commuters using this path are facing alot of propblems . They later submitted a memorandum to the Deputy Commissioner and Thanked all who have particated in the protest. Dakshina Kannada interim Congress President Ibrahim Kodijal , president, Congress committee south constituency Balakrishna Shetty, Corporator Asha D’Silva , Youth Congress leader Ashith Pereira and others were present. Is it a genuine protest , Or just to gain public support. there are so mnay such projects pending?